To resolve email triage cases more quickly and efficiently, communication in Pega Intelligent Virtual Assistant™ (IVA) for Email is enhanced. You can reply to any email address, instead of only to the email address of an IVA triage case operator. Furthermore, response options are expanded with ability to forward, reply all, carbon copy (cc), and blind carbon-copy (cc). You can send Pulse messages to discuss case details without exposing the information to external users. You are automatically notified in the Email Manager and Case Manager portals if you receive Pulse messages. Even when an email case has been resolved and appears as read-only, you can still send Pulse messages to further discuss the triage case details. 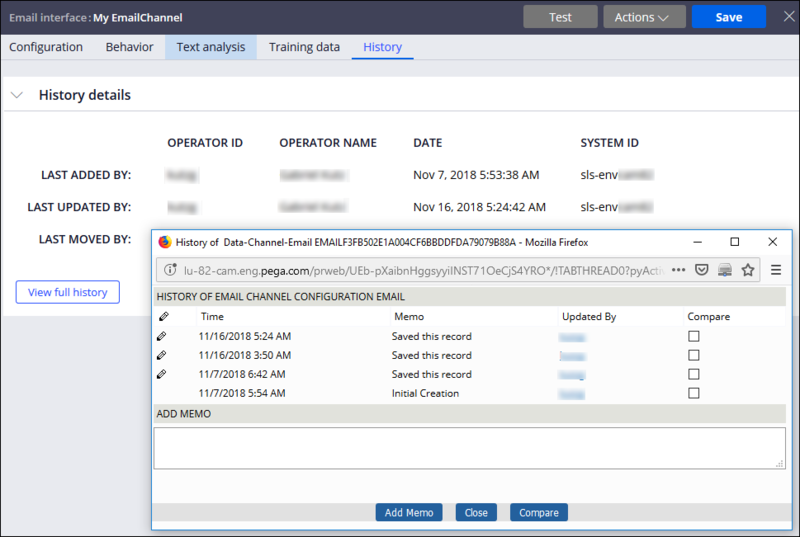 To make IVA for Email easier to manage during development, you can track all the Email channel configuration changes that you or other operators make. View the history of changes on the History tab and also compare Email channel configuration save records. 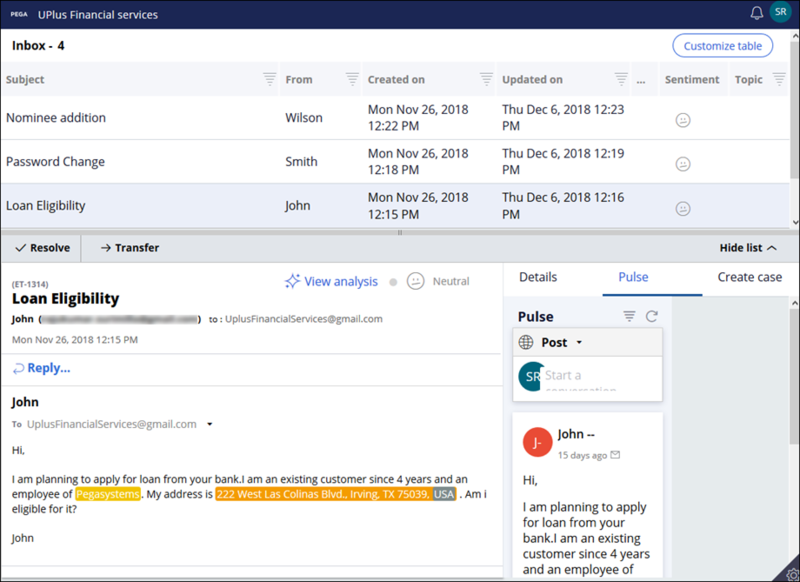 To enhance text analysis in IVA and improve the responsiveness to emails, the system detects defined entities not only in the contents of the email messages and its attached files but also in the email subject field. You can map same text that appears in separate places in an email triage case to different entities. For example, you can map the text 'James' that appears in an email in two different places as 'James Street' and 'James Norton', to two separate entities: a street name and a first name. For more information, see Email triage, Enabling the analysis of subject field content during email triage, and Tracking configuration changes in the Email channel.